Previous news articles from Glencrest. We have now been able to produce our parasols using fabrics that have a 50+ UV rating which is very high. The quality of our parasols has been exceptional this season with many customers saying how great they are. Seen our latest environmentally safe Golden Care range of products? Something that we are very keen for you to take advantage of; it's the latest range of complete care items for outdoor living. We have everything in the cleaning, patinizing, protecting and polishing range to care for furniture in Teak, Textilene, Resin; barbeques in Stainless steal, timber decking plus fabric cleaner and hardstone protector. Golden care maintenance products not only perform well, they are also safe for the environment. Being manufactured using a water-based solution they are completely free of solvents, also non toxic, non corrosive 100% biodegradable and will not irritate the skin. Almost all other like products being sold are oil based and carry warnings of toxicity on the label. You can present our Golden Care range in a smart hardwood stand with free TV which runs the promotional video if you order the full set, or you can have a reduced range in simpler display packaging. All products have been test marketed in Bents, Ruxley Manor and Alton Garden Centre, results were very good and all said yes they would like to continue to sell the Golden Care range. It is essential to be able to offer the full range of products to the customer who, let's face it, pays a lot more on their outdoor living accessories nowadays than ever before and wants to keep everything looking as good as new! Sales continue to grow for our Golden Care range of garden furniture and outdoor product maintenance. Tested in three of the UK's most prominent Garden Centres last season, the entire range came up trumps, confirming our judgement on the saleability of this high end product. Golden Care was launched at Glee and to date we have been amazed at the up take and sales. The tailor-made point of sale stands makes it easy for the consumer to select the right care product for outdoor furniture be it Teak, Hardwood or Aluminium. Eco friendly and easy to use, these products are just flying off the shelves. The Golden Care Range of products covers the entire range of cleaning, restoration and protection for outdoor furniture, barbeques and other accessories. In addition and very importantly they are 100% water based, contain no solvents, are non-toxic, non-corrosive and 100% biodegradable, (unlike the greater percentage of competitor products). Bringing teak back to life after years of ill treatment and neglect might seem like an impossible job, but Golden Care has a range of products perfectly placed to do just that. Their teak cleaner, which also comes with the correct application sponge, brilliantly restores discoloured and dark grey teak and hardwoods, bringing back the original look. 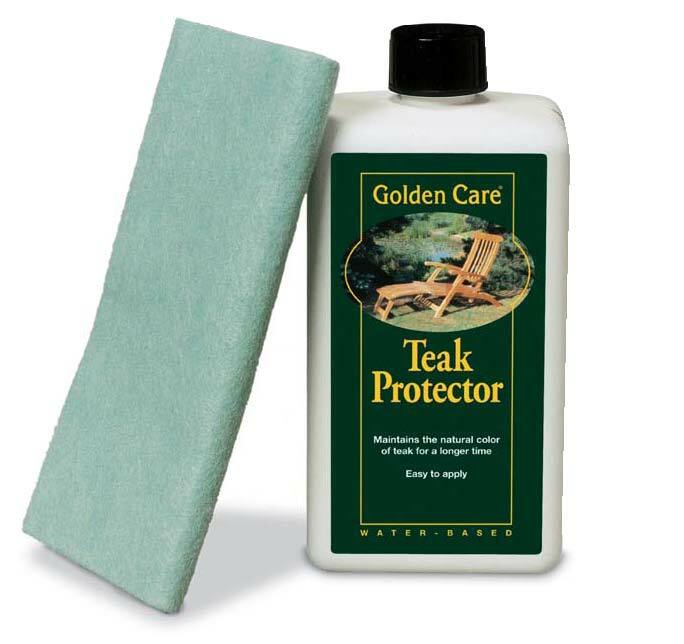 To retain that look use it's companion, the Golden Care teak protector for a finish that lasts up to four times longer than other proprietary protectors. As a gift item these are available as a three in one kit, including application tools. Teak is most often known for it's grey weathered look, using the Golden Care patinizer wood achieves a measured patinization without black spots, green patches or any other discolouration. 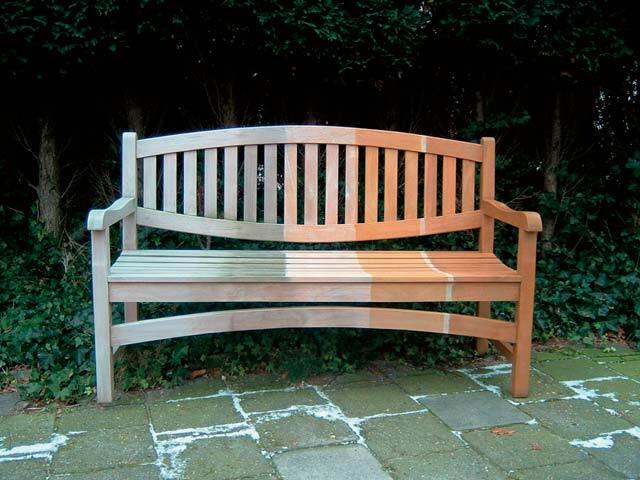 To achieve an even lighter finish there is a specific whitener which takes the teak to a silvery grey / white colour, slows the effects of weathering and prevents green or black spots. For the ultimate in protection against wine stains, grease, coffee etc use the teak shield, it impregnates the wood and gives an almost invisible shield, it is also very suitable for indoor wooden furniture. For hard woods of a much redder or darker colour the hardwood protector brings out and maintains a naturally darker, redder colour for longer. All of the other products can also be used on these hardwoods. For anodised aluminium Golden Care has restorer, to restore weathering and oxidisation, polisher, to take corroded surfaces back to it's original state and protector to maintain the original shine and look of anodised aluminium for longer. For powder coated and cast aluminium there is a cleaner and wax polisher, which removes all the grime and then protects the finish and for stainless steel there is a cleaner, a polisher and a combined two in one product. For Textilene and wovens there are specific cleaners and other fabrics benefit from dedicated cleaners and protectors. Hardstone, glass and resin also have their own cleaners, protectors and polishes. Next come the decking and fence products, there is a complete range including cleaner, protector and patinizer that can be used on any hard wood. Old decking and fencing can be brought back to life and made to look as good as new, to either the original colour of the wood or a patinized grey. Last but not least a range of products for cleaning, degreasing and polishing barbecues, also available as a three in one kit for gift and easy storage. To show these products off to best effect the Golden Care range can be displayed in a hardwood merchandising unit which incorporates a t.v. screen and dvd player for playing the instructional DVD, an invaluable way to get the message across to the customer. We now carry 2m, 2.5m, 3m and 3 x 2m Hardwood parasols, plus a the same range of sizes in aluminium crank. Blue, green, terracotta, black, taupe and natural are available in every size. We also offer a wide range of cantilever parasols in aluminium. 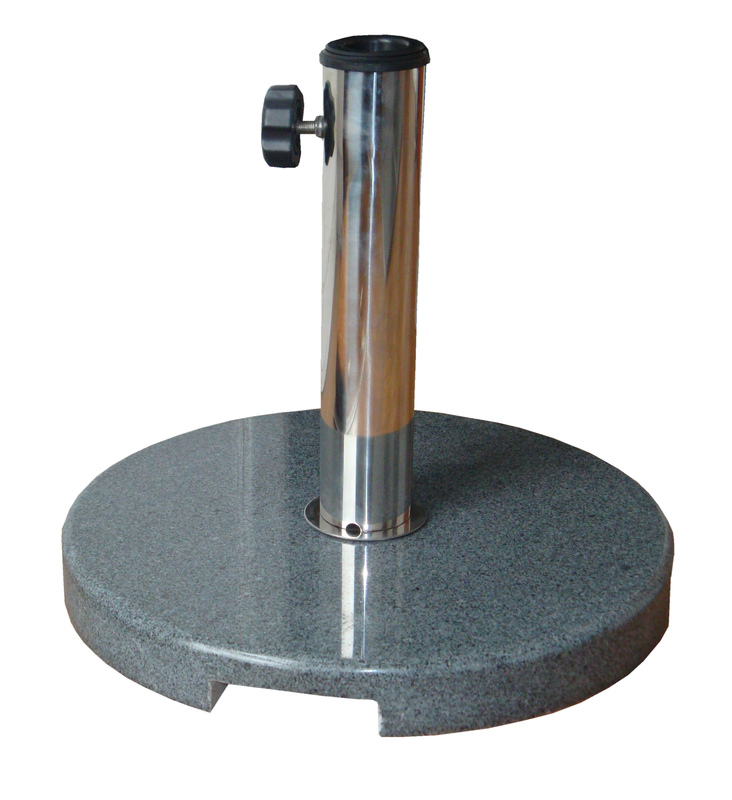 The range of parasol bases in concrete and granite is larger than ever. The 15,20 and 25 kilo concrete bases come in 4 colour display boxes. We have a great NEW range of parasol bases to start the new season with they range from £15.00 to £48.00 TRADE .We have two ranges which are STURDI Concrete and STURDI PLUS Granite the size vary from 15kg to 48kg.The last few seasons we have done very well with our concrete bases and decided to expand our range further by having more sizes. We now offer 15/20/25 and a very large 50 kilo concrete base all in black. Priced very competitvely and supplied in super 4 colour display cartons these bases fly of your shelf. To place your order or reserve stock please don't hesitate to contact our sales team via email, phone or fax.